Today is Election Day in the United States, and so much is at stake right now, it's not even funny. The vote today is literally a matter of life or death for so many vulnerable Americans. We can only hope that despite flirting with a total disaster candidate, that America will wake up and do the right thing today. 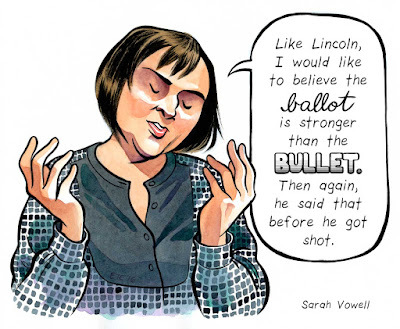 The Nib has been doing some great work during the campaign--I'm so glad it's back!--and here is one by Ellen T Crenshaw, featuring quotes from people relating to voting. You can read the comic in full here. I really like how Crenshaw makes sure that the images are large enough that we don't just rush over and read the quote. There's enough heft that we want to see how she handles Lincoln's mole, for example, or the way in which she poses Sarah Vowell in a manner that suggests some wry expression to match the quote. Her final quote, featuring President Obama, really highlights his demeanor when he speaks. Additionally, Crenshaw also works the lettering to keep it varied, both between the quotes and within them. 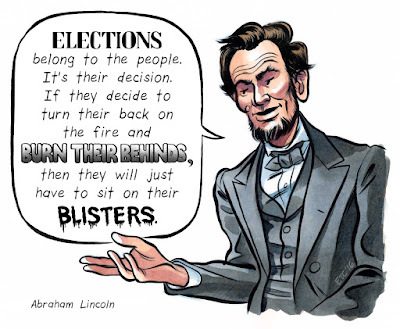 The Lincoln speech bubble has four different lettering fonts, for example. We can't know what will happen today, but we can encourage you to vote. Al Franken, who is now one of the nation's best Senators, was elected by a margin of 311 in his first Senate race. 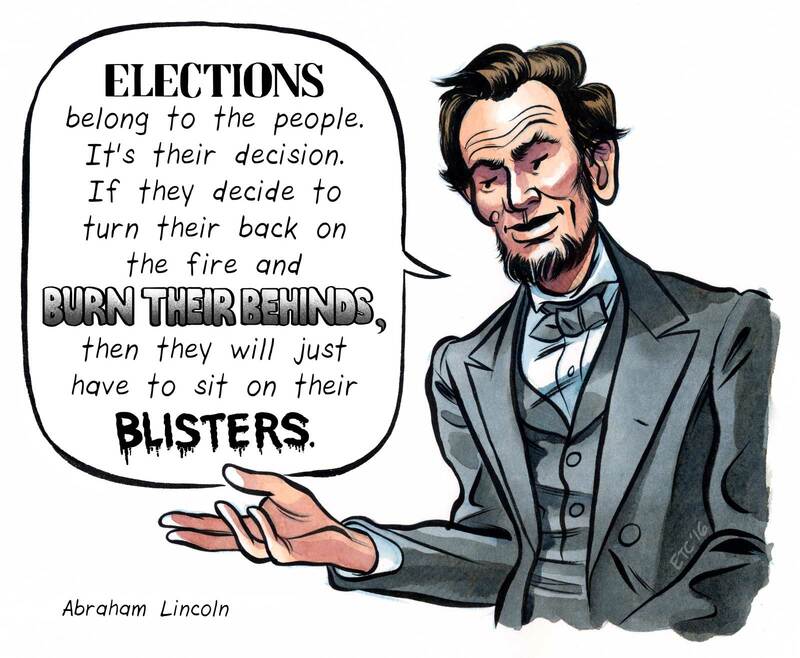 With so much riding on the outcome, now is not the time to hesitate--as these speakers from Crenshaw's drawings say--Vote! Vote! Vote!